Take a look at the “Casa Terracotta” by Colombian architect Octavio Mendoza, located in Villa de Leyva, Colombia. It’s the largest ceramic work in the world! If any of you have seen works by the Catalán architect Antoni Gaudí, surely Casa Terracota will remind you of them. 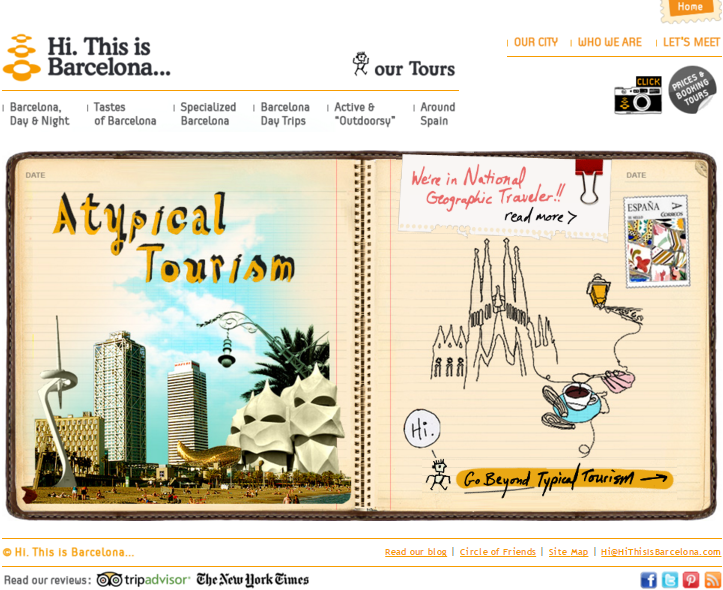 The influence of Gaudí is undeniable! Interior of Gaudí’s crypt at the Colonia Guell. The world famous Catalán technically belonged to the “Moderniste” movement of the late 19th and early 20th Centuries, paralleling the Art Nouveau movement in France. By the end of his career, however, Gaudí had forged a style all his own. So much so, that he didn’t leave any real “disciples” nor school of followers behind. 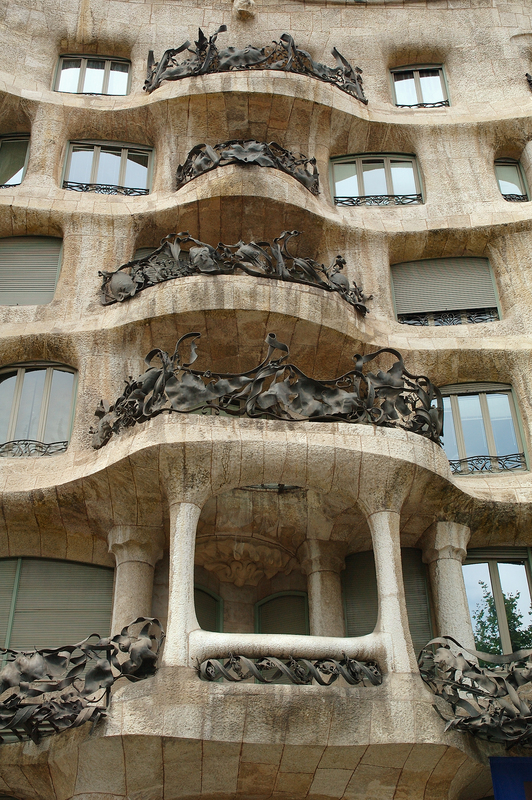 No one was ever able to design buildings quite like his; Gaudi’s style was extremely personal. Gaudí’s buildings always stand alone in their uniqueness, above all in the way they’re built – using laws of nature instead of architectural principles – and the organic qualities they possess. They seem to be living creatures themselves. Rooftop terraces in Antonio Gaudi’s La Pedrera. Rooftop terrace, Casa Terracota. Colombia. Master Bedroom, Casa Terracota. Octavio Mendoza. Exterior of Guell Crypt, Antonio Gaudí. Gaudí was heavily influenced by nature, and also felt that his buildings should in a way interact with and pay tribute to the natural world. He often said things like “See that tree outside my window? He is my teacher”. He also felt that those who built according to the laws of nature were building in God’s plan. He frequently paid homage to the surrounding wildlife in his architecture, including having sculpturally depicted over 50 different species on Sagrada Familia alone. Snail gargoyle, to dispose of excess water. Sagrada Familia, Gaudi. Spider web window and animal rain spout. Casa Terracota, Mendoza. As a boy in the 1860’s, Gaudí, who had a disease similar to early-onset arthritis, didn’t to much running and playing as the other kids did. Instead, he would sit in the fields and observe that which immediately surrounded him in the natural world: spider webs, snail shells, olive branches, poppies… and later, all of these forms from the natural world found their way into his architecture. Park Guell, Barcelona – Antonio Gaudí. With Park Guell, Gaudí actually had stone-pickers dig tunnels into the mountain on which the park was built to extract stone to build structures all around the park, so that the man-made parts would blend in with the natural ones. Broken-tile mosaic is a way that both Mendoza and Gaudi were able to solve the problem of covering curvy, organically shaped architectural forms… not to mention they look pretty nice! Gaudi, and his collaborators, were pioneers of this technique, which they called Trencadís. 1) You can build using only your hands and farming tools. You can create your house or building however you’d like it to be, and to meet all of your specific needs, including the objects and furniture inside, and all at an affordable cost. 2) The objects and forms you create for and around the house are all 100% unique and personalized, and can vary depending on your specific needs and the use of the structure: residence, recreation, industry, etc. 3) Clay is thermal; holds in the sun’s energy to keep you warm during cold weather, but also keeps you cool in the heat. 4) Since these buildings uses natural processes, they provides you with new ways to co-exist with our environment. For example, in places like California, buildings like these would be the solution for surviving the frequent wild fires. In a fire, only your personal belongings would burn; the house itself would withstand the flames. In fact, the structure would only become stronger with the heat. Remember, ceramic is the only form of architecture that REQUIRES burning! Palau Guell Chimneys, Antoni Gaudi. 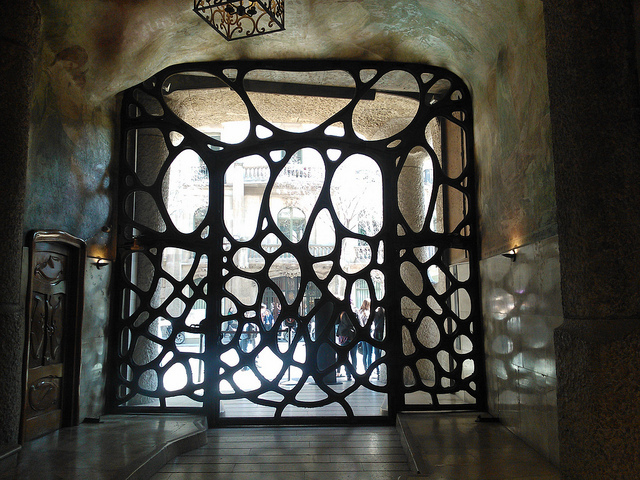 Wrought iron front door entrance, La Pedrera. Stairway, Casa Terracota. By Octavio Mendoza; Colombia. This entry was posted in Barcelona and around, Gaudi Architecture, Moderniste Architecture and tagged Antoni Gaudi, Architecture, Barcelona, barcelona art, Gaudi Tours in Barcelona, Modernisme. Bookmark the permalink.